1967 Chevrolet Chevrolet El Camino for sale in Grants Pass Oregon 97526 . Hot Rod for sale. Looking over the receipts and money spent on this 1967 Chevrolet El Camino is a quick reminder that is always better to buy someone else’s project then building it yourself. No car or bike is ever finished, but the heavy pulling is always better when done by the last owner. In this case the car is being sold as part of liquidating an entire household for a move out of State to a simpler retired life in Texas. The first thing you see when looking at the car is how straight the body is. There are no ripples, no mismatched seams, just signs of a lot of blocking prior to the finish being put on. The car is local and has been complete for several years. We have a folder of receipts including the rebuilding of the Transmission, brakes overhauled, Ceramic Headers, Edelbrock carburetor installed, the fitting of a Vintage Air AC system, the list goes on for pages. The engine, a 396, runs and sounds great, the AC blows cold and the Dakota Digital Dash is easy to read and best of all, the gauges all work! The only issue worth noting is that there was repair work done to the floor under the driver’s side that was not done properly. The selling price reflects this and leaves plenty of room for sorting it out and still being in the car well. The selling price is $13,895. VIN# 101215. For other interesting bikes and collectable vehicles, visit our web site http://www.automaniagp.com 541 479 8888 or come by and see us at 895 SE Gladiola Drive, Grants Pass, Oregon, 97526. Oregon Dealer DA1287. 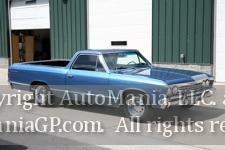 You are viewing a listing for a 1967 Chevrolet Chevrolet El Camino for sale in Grants Pass Oregon 97526 on AutoManiaGP.com. We encourage you to contact us by phone, email or text to get more details and how to purchase the unit.